For those travelling to us by car, parking near our practice has become increasingly more difficult during office hours. We have our own, limited car parking facility for approx. 6 vehicles at the rear of our premises on Longdene Road. We also have an arrangement at Weyhill House (previously known as the Crown and Cushion public house) on the junction of Weyhill and Weydown Road. There is a barrier entry system with an intercom directly to the practice for admission. This is a free car parking facility and is only a 2 minute walk from the practice. 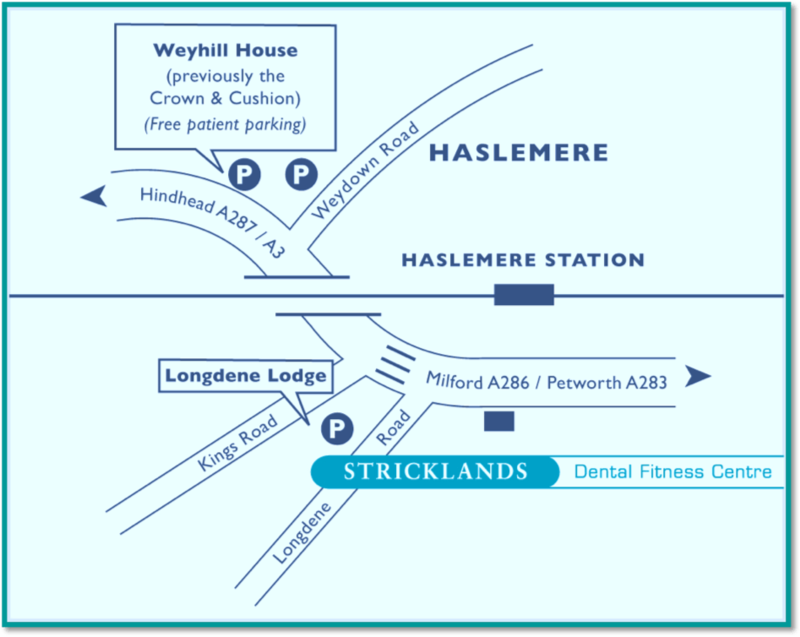 We have organised with our neighbours at “The Station House” public house that patients at Stricklands may use the upper section of their patrons car park (drive in front of the building and access to the car park is to the right). If using this option, please display a note (or appointment card) indicating that you are a patient at Stricklands. Please note, the road/path to this car park is extremely steep and not suitable for less agile patients. In addition, we also have permission for you to use the customer car park at Majestic Wine Warehouse towards Weyhill. If using this option, please park in the spaces to the right of the shop entrance and again, display a note (or appointment card) indicating that you are a patient at Stricklands. If you would like further details or have any suggestions as to other ways in which we can help with this problem, please speak with any member of our practice team.